Eaten raw, blueberries are lovely—they’re satisfying, fresh-tasting and able to be eaten like M&M’s. But blueberries really benefit from fire. When you eat warm blueberries, you experience the gratifying pop that they make when their thick skins break and release sweet, midnight purple juices. That they can stain fingernails for days is a testament to their concentrated sweet-tart flavor; yes, warm blueberries are powerful. And warm blueberries and cold ice cream are infallible. Especially when in Maine, I chase blueberries during their season: super-fruity purple native and hand-picked blueberry ice cream from Shaw’s Ridge Farm in Sanford; blueberry juice, blueberry pancakes, and blueberry muffins at the charming Cove Café in Ogunquit; and even the blueberry pie (with ice cream and whipped cream) from Fisherman’s Catch in Wells. All are delicious but the associated memories cannot compare to those from that first time at the Goldenrod. The slice the waitress delivered, which I shared with my mom, was filled with small blueberries that were sticky-sweet but that still held their shape. All that mattered were the guts; once the crust had been mostly eaten, my mom and I chased blueberries around the ice cream–slicked plate with our spoons, competing for each roly-poly blue jewel, mellowed and complemented by what, at this point, was essentially vanilla crème Anglaise. The blueberry chase is the most fun of games. What was left on the plate was a lick of light purple (the deep violet had been softened by the now intermixed vanilla soup), freckled liquid that we’d have likely taken to our faces had we been at home. 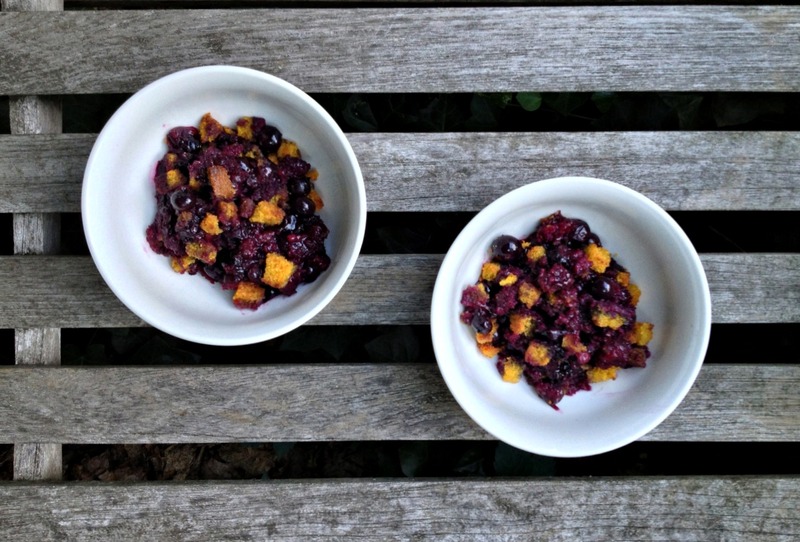 This combination has sparked many other food adventures, and the first-ever recipe I wrote for myself, many years ago, was for my ideal blueberry crisp—in fact, facets of that recipe have been worked into today’s. 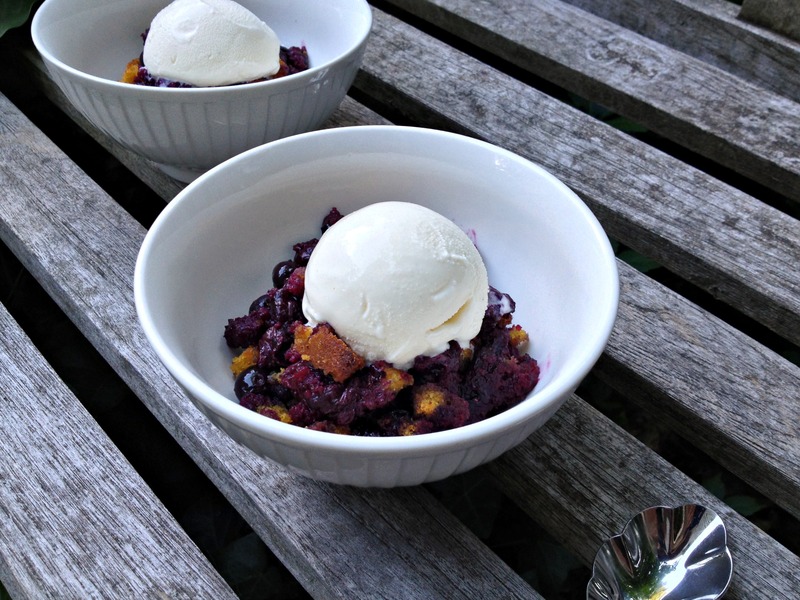 I wanted a warm, luscious blueberry dessert that could only be improved by a scoop of vanilla. A dessert, like that pie à la mode, that becomes one with its topping. So I created Betty. Previously, I didn’t get the concept of a brown Betty, which is seen most commonly with apples. Fruit intermingled with bread—or bread-based desserts in general, like bread puddings—isn’t something I gravitate towards. But remembering how much I enjoy the combination of sweet-tangy blueberry with sweet-buttery corn, I decided to give Betty a chance, using Southern-style cornbread (no sugar, no flour, cooked in fat in a cast-iron skillet) as the bread. A scant amount of crumbs soak up some blueberry juice but not too much; I like nectars to be able to run free. Those that do get absorbed are infused with an intense corn flavor. 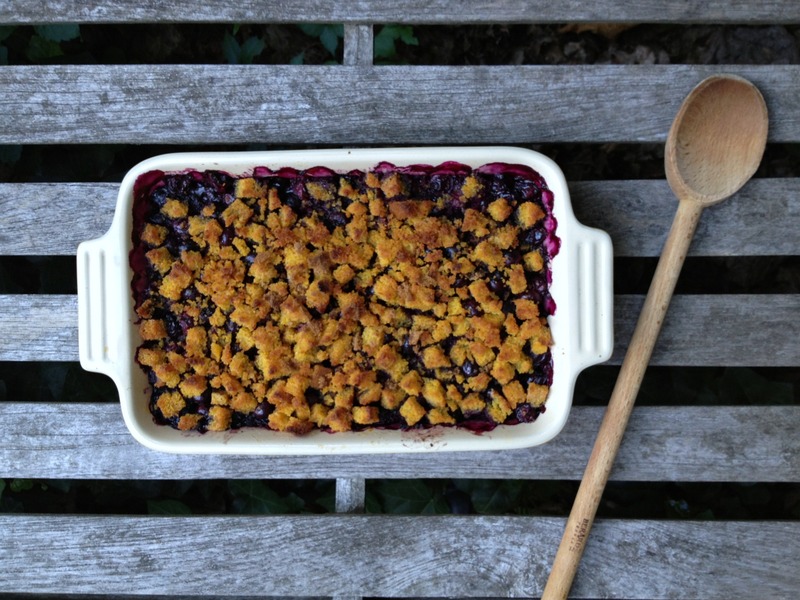 The bread crumbs don’t feel mushy; they feel like they’re a part of the molten blueberries. The topping is buttery and super crisp on the outside, but the center of the cornbread cubes are tender and able to absorb blueberry juice. The topping caramelizes in the oven. 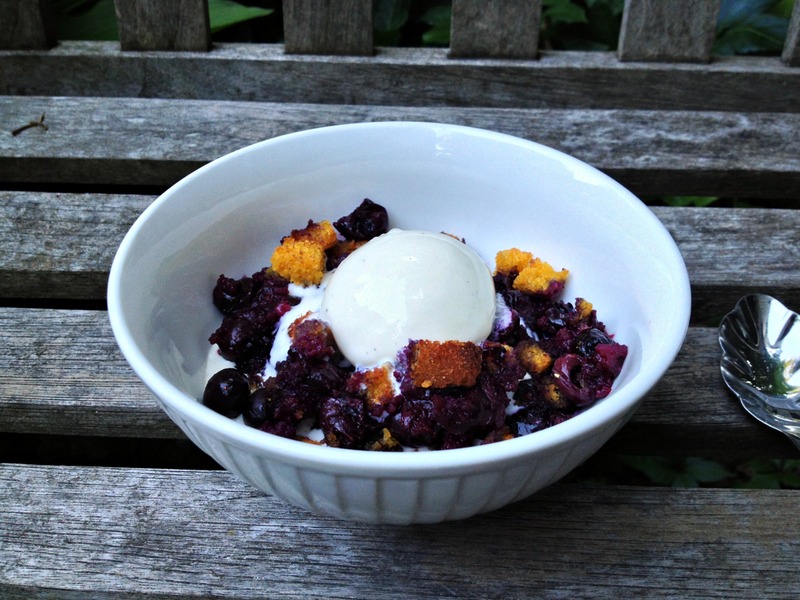 It’s my favorite breakfast muffin (blueberry-corn) transformed into a just-sweet-enough dessert that’s juicy, texturally appealing, and made for ice cream. I’m not sure what this says about my life, but eating this brown Betty, outside with bees and mosquitos competing with me for each bite and with sticky, ice cream drips leaving their marks all over bench, plants, and ground, has been the highlight of my summer so far. While it’s not the pie at the Goldenrod and it was not enjoyed with my mother, it brought joy to an overcast summer day. I used a Cook’s Country recipe that I loved. I’ve also made the recipe from the Joy of Cooking. Whatever you use, you want to make sure the recipe contains little to no sugar (no more than a teaspoon or two if any—we don’t need sweetness) and no flour. Adjust the amount of sugar and lemon to the sweetness of the blueberries you’re using. 2. Spread fine crumbs on baking sheet. Spread cubes on second sheet. Place sheet of crumbs on lower rack; place sheet of cubes on top shelf. Bake until crumbs are nicely golden and cubes feel dry, 10 to 15 minutes, rotating (but not switching) sheets halfway through baking. 3. Meanwhile, butter 1¼-quart baking dish or something of similar size like a roomy deep-dish pie plate. Toss blueberries, sugar, cornstarch, lemon zest and juice, vanilla, and salt together in large bowl. Sprinkle bottom of baking dish with half of cornbread crumbs. Top with half of blueberry mixture, followed by half of remaining cornbread crumbs and remaining half of blueberry mixture. Cover baking dish with aluminum foil and bake for 15 minutes. Remove foil and bake until all blueberries are bubbling and juicy but still intact, 20 to 25 minutes. 4. Remove dish from oven and increase oven temperature to 425. Toss cornbread cubes with brown sugar in bowl. Sprinkle cubes evenly over blueberries. Fill in big spaces with remaining crumbs if desired (but I like the dish when it’s not completely covered). Sprinkle any sugar that fell to the bottom of bowl over cornbread cubes and back until cubes are well-toasted and browned. Let brown betty cool for at least 10 minutes before serving warm with ice cream. 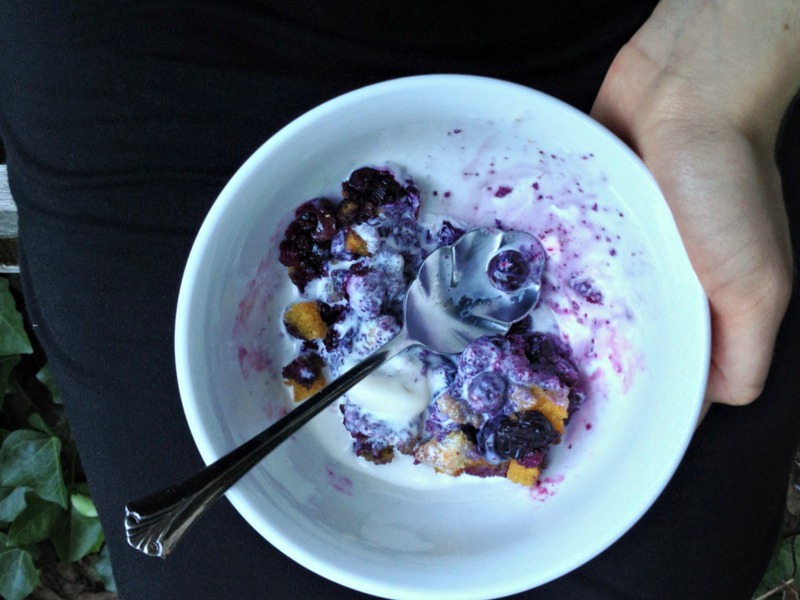 Hot blueberries and cold ice cream are my idea of dessert heaven, as you say, in any form. This looks so so good – I love the idea of the cornbread topping and the yellow colour looks *so* pretty with the purple blueberries. Thank you! 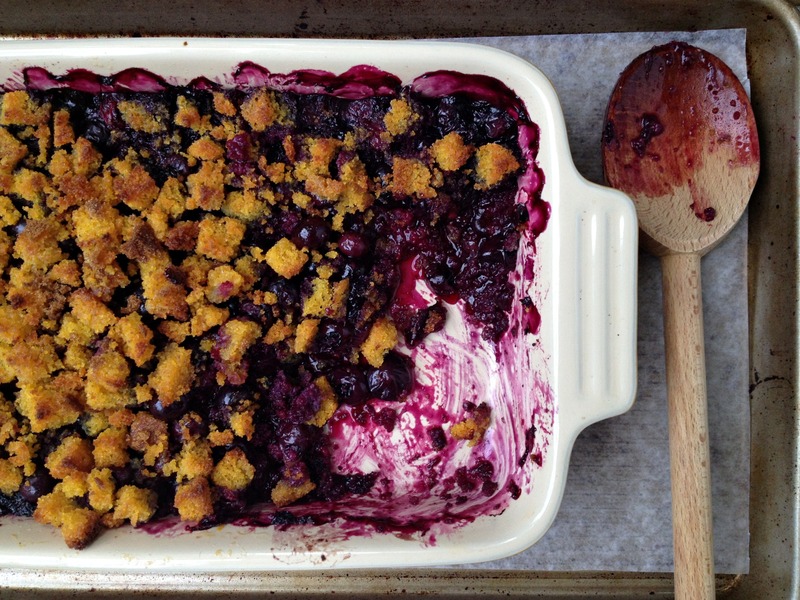 That blueberry and plum crisp that’s going to be in your book, as you noted, looks divine for the same reason. Looking forward to it! I can definitely see this being a highlight of my summer too :) I have a blueberry ice cream recipe coming up in the next couple of weeks, and now I wish I had a warm betty to eat it with! Looking forward to the blueberry ice cream. I’ve only once had blueberry alone in ice cream, and it was in Maine (no surprise there!). I think double blueberry would be heavenly. Oh, how wonderful! But, alas, our blueberry season just suddenly stopped without warning this summer. Before I even bought any for freezing. Will have to wait until next year, but I will try this, as it looks just about perfect. Oh, no! Blueberries are still going strong here. Our season for everything was a little later given how terrible the winter was, but I’m sorry that you were robbed of them so prematurely! Do you have a favorite cornbread recipe? I like this one for the Betty because it’s uniform in texture so easy to slice and toast, but I love eating crumblier versions too. Hi, Becky. Thanks for your comment! The link does work, but you’re probably reaching a paywall, because the Cook’s Country website (for the magazine) is a subscription-based website. I linked to it so those who do subscribe could use it, but you can use any 10-inch skillet Southern-Style cornbread (no flour [or just a little], no sugar [or a few teaspoons]) recipe. The one in the Joy of Cooking is quite good as well, and there are several online. I hope that helps.